Ian Howarth specializes in modern, contemporary style wedding photography which is carried out in a professional and unobtrusive way. 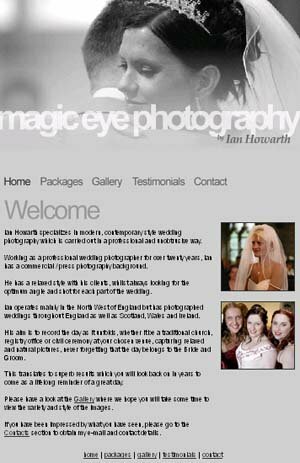 Working as a professional wedding photographer for over twenty years, Ian has a commercial / press photography background. He has a relaxed style with his clients, whilst always looking for the optimum angle and shot for each part of the wedding. Ian operates mainly in the North West of England but has photographed weddings throughout England as well as Scotland, Wales and Ireland. His aim is to record the day as it unfolds, whether it be a traditional church, registry office or civil ceremony at your chosen venue, capturing relaxed and natural pictures, never forgetting that the day belongs to the Bride and Groom. This translates to superb results which you will look back on in years to come as a lifelong reminder of a great day.